​​​​​ ​AUSTIN – The Austin-American Statesman’s prime downtown location is slated for major redevelopment. 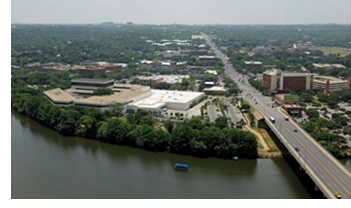 The 19-acre site is situated on the south shore of Lady Bird Lake at 305 S Congress Ave. It's one of the largest infill projects close to downtown—a mix of offices, homes, shops and possibly a hotel are envisioned for the location—about 2.1 million sf in all. The project is part of the city's wider South Central Waterfront Initiative, which envisions dense, mixed-use development springing up across the lake from downtown. Skidmore Owings & Merrill LLP, a Chicago-based architecture and urban planning firm, has been named master planner, and CMG Landscape Architecture of San Francisco has been brought on to handle landscape architecture.